T. Michael Martin’s debut novel is a transcendent thriller filled with electrifying action, searing emotional insight, and unexpected romance. The hardest reviews to write are always the ones that I had nothing completely against or anything that I loved entirely. The End Games was clearly one of those as I’m struggling to find words to place together and form comprehendible sentences. Yet on all, The End Games was rather enjoyable. It’s simple enough. The rules in the Game. Follow them, collect points and keep away from Bellows and you will find the Safe Zone. But if it were only that simple. 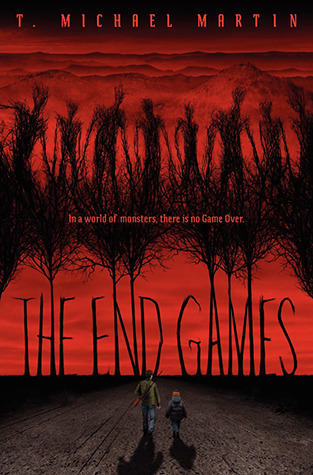 At a glance, The End Game’s premise is rather absurd. But once becoming enveloped into the novel, twists will jump out and surprise you when you least expect it. In a new take on aliens in sci-fi world, Bellows are the alive dead that are a mixture of zombies/vampires where they imitate people talking in a ‘bellowing’ voice and bite them. Their bite is viscous, if a human comes intact with one, they will also soon evolve into a Bellow. Michael tells is five year old brother, Patrick, that the ‘Game Master’ guides them to the Safe Zone where they will meet their mother. But who is the Game Master? Why do they need to collect points? Martin successfully illusions the atmosphere with doubt, suspicion and sceptical-ness towards each and every character. This original level of uncertainty Martin created brightened up The End Games even at the most uneventful of times. Told in third person, naturally it is hard to relate or understand what the characters are pondering in their minds etc. However Martin accomplishes this aspect so flawlessly it seems rather surreal and impossible at times. Not only was each character outlined intricately, the relationships with the main character were so diverse and attaching. Michael, our main character is not exactly what he seems on the surface. He holds are dark, secretive regret towards his little brother, and deems that it’s wrong to tell Patrick what really is going on. What I admired about this was Michael’s protectiveness and intelligence. Majority of Michael’s actions were reasonable and not out of impulse. Yet still, I constantly felt a nagging point of him where he was too overly regretful of his own actions etc. sometimes, Michael was too caught up in self regret to acknowledge the urgent issues being addressed. Despite all negativity, The End Games will promise a heart warming relationship between the two brothers; Michael and Patrick. I was constantly relating them back to me and my own sister. Many people remark that our age difference is excruciatingly large and what a surprise it is that we kind of get along. And nothing beats one where the ages are 17 and 5. That is DOUBLE the age difference of my sister and I. In post-apocalyptic situations, Martin lightened, ever so skilfully, the mood with this gravitating interaction that kept me entertained during the attention-poo- ish holes, but also levelled out a blunt sense of humour to really make this book stand out. Another relationship I found loveable was Jopek’s and Michael’s. Jopek, is, in my opinion much more eventful than the Bellows, I felt like the Bellows were just some random alive dead corpses running around moaning nothing was to horrifying. It only seemed to add a slight tinge of atmospheric taste to The Games. But Jopek, was what I found fascinating to analyse. Definitely a unpredictable character, jumping out unexpectedly, Jopek manages to make The End Games far more eventful. Half the time, I really couldn’t know what to expect when Jopek was part of the plot as his attitude and motions were just slightly abnormal. The way he interacted with Michael striked me as jovial then seriously intense at other times. Completely contrasting. All in all, The End Games was somewhat satisfying while I believe it could have been improved in many levels (i. e. Bellows playing a larger role). The characters were definitely a strong point in this book as well as the idea and twists. An eerie debut novel that kept me struggling to find coherent words. I love the concept of this book and it’s great that there is a good bond between two brothers. I always like it when there is a family aspect 🙂 The bellows sound interesting; mixtures of different paranormal creatures are always refreshing. Great review and I’m definitely going to read this book. It sounds like something I will really enjoy. I haven’t heard much about this but I am interested, especially after enjoying The 5th Game. I like the sound of the bond between the brothers and I’m glad that the 3rd person POV worked well in this book! The 5th Wave certainly made me look at the science fiction genre more civilly. While it wasn’t as good, there were still some great elements here! Oh Jopek was definitely an interesting character. I completely agree with that! I loved that he was so difficult to understand and predict. And, funnily enough, I too thought of my own sister when reading about Michael and Patrick. 🙂 I thought the author did a fantastic job depicting their relationship there. This wasn’t a favorite for me either, though. We see exactly eye to eye on this one! Awesome review, darling! Great review! Even though this wasn’t a perfect book, it still sounds like you enjoyed it, which is awesome! I’m trying to decide if I think this book would really be for me. It definitely sounds like there’s a cool story going on though, so maybe I’ll give it a try! WHOOHOO, ZOMBIES ARE MY MIDDLE NAME. Glad this one (sort of) workedfor you lovely <33 I wi be checking this one out soon. Hmmm. This sounds nothing like what I expected. Interesting.